Durant was awesome and that’s cool… But what about the Wolves? That quote applies to last night’s game. Well, it applies to being a Timberwolves fan at Target Center during last night’s game when Kevin Durant scored 48 points. Durant was splitting Corey Brewer-Dante Cunningham double teams. (Yes, apparently, that’s possible.) He was sticking so many ridiculous 3s that he rimmed out a heat check from 42 feet out (all numbers approximate). And he, of course, was served his Closer Coffee after the game for hitting a silky smooth, ice cold dagger off the dribble for the win. The quote comes from Harvey Araton’s excellent When The Garden Was Eden. I’ve used it before when doing some soul-search blogging about why I care about millionaires throwing a sphere through a ring. Kevin Durant ranks right with Jordan and Kobe as one of the greatest scorers I have ever seen. To see him drop an angry 48 on a pick-up-the-slack night Without Westbrook was something I’ll never forget. And with that out of the way: The Timberwolves. With that unfortunate loss — the second disappointing one at Target Center in the past week — they drop back below .500. Kevin Love made some incredible plays. Down the stretch, he was faced with the unfortunate (but necessary) task of playing hero ball against Serge Ibaka. Love made a sky hook (I think that’s what we have to call his new-and-improved hook when it comes against longer defenders. It’s insane.) and also made an unbelievably clutch basket and the foul with 27 seconds left in the game. The free throw, which Love would obviously make, would give the Wolves a lead. Then the Thunder would need to take a quicker shot instead of hold for one. But Love short armed it, catching the front of the rim. Then Durant went Durant for a two-point lead. Then Love somehow drew another foul, this time on a three! So we were good. Love got his miss out of the way, he’d make these three and we’d all go home happy. Then we all marched outside where it was thirty or fifty or I don’t even care how many degrees below zero. Love wasn’t the reason the Wolves lost, even if his free throw misses contributed. The bench played poorly, as it often does. Corey Brewer did not defend Durant very well, even when you consider the difficulty of some of KD’s shots. Brewer reaches in more than a good isolation defender would. (Durant was 12-13 from the foul line.) This was one of the few matchups where the Wolves really would’ve liked to have Luc Richard Mbah a Moute available. Of course, it was the one game that he was out with an injury. Ricky Rubio doesn’t shoot at an NBA level, but does a great job of hiding this fact until opponents reveal it for him. And, as we’re discovering, that happens during Winning Time when all plays take on greater subjective meaning. Rubio played a very good game last night, but his scoring limitations hurt the fourth-quarter offense. So the Wolves lost another winnable game and fans are left wondering what it all means. 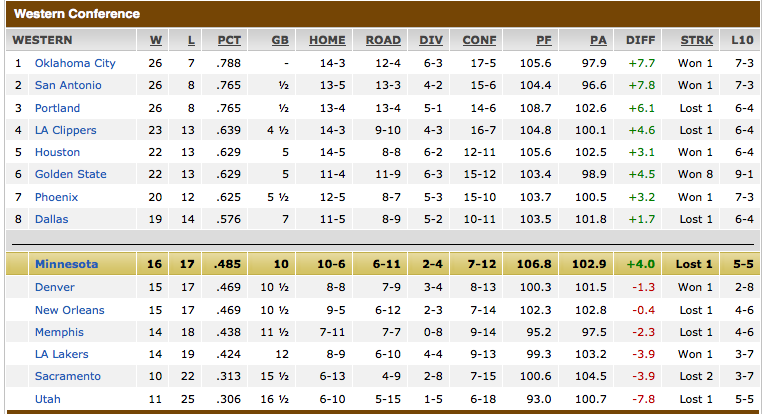 Ninth place in the West. That’s the worst possible place to end the season as it means the Wolves will both miss the playoffs and send their Top-13 protected first round pick to Phoenix. As you can see, their averaging point margin is better than every other currently-non-playoffs team and is even better than Houston, Phoenix and Dallas who are in the playoff picture. That’s encouraging, but also misleading. The Wolves have a front-running team. When they get it going — usually against bad teams — they pile it on. Down the stretch of a close game they look nothing like their run-and-gun, turnover-forcing and outlet passing selves from first quarters a plenty. The Wolves are not better than the Rockets. But they might be better than the Suns and Mavericks. Without digging into the numbers or even giving this much thought, I just think this is true. (I said so. So there!) If the key guys stay healthy, I think the Wolves have a good shot at finishing in the top 7 or 8 in the West. That sounds a little bit more encouraging than it maybe should. After all, a playoff appearance in and of itself was kind of the season goal, right? * There’s a clear Top 6 in the West, a huge gulf, and then everyone else. And the Wolves are not on the sunny side of that gulf. The Spurs, Thunder, Clippers, Warriors, Rockets and Blazers are all great teams. The Wolves are not in that company despite having a veteran team with a salary cap situation set in stone. * If the Wolves make the playoffs it will be more due to others underachieving (Marc Gasol’s injury in Memphis, Monty Williams not figuring out how to use good players in New Orleans, Denver blowing up a really good team) than the Wolves getting better. The only improvement the Wolves have made is discouraging knuckle push-ups or anything else that might cause someone to break bones in his hand. * Kevin Love is by far and away the biggest reason that the Timberwolves are competitive. I’m sure he is smart enough to realize this. If he envisions a future here like Kevin Garnett’s, why should he stay? * Love and Pek are awesome and complementary on offense. But on defense, they basically ensure that the Wolves won’t have an elite defense. So for the TEAM to be elite (someday?) they need to be great on offense. And then you watch Rubio shoot and Brewer dribble and you get concerned. Anyway, that’s the situation as I see it.